I love trying new things. I get excited to have hands on experience and opportunities to explore new ideas/concepts and the ability to incorporate them into my every day life. It’s part of why I am a life long learner and eager to continually improve myself. I am also a bit of a tech junkie. You will rarely find me without my smartphone AND tablet, plus other little gadgets that go along with them. I was very excited when asked to take part in trying out MavSocial. 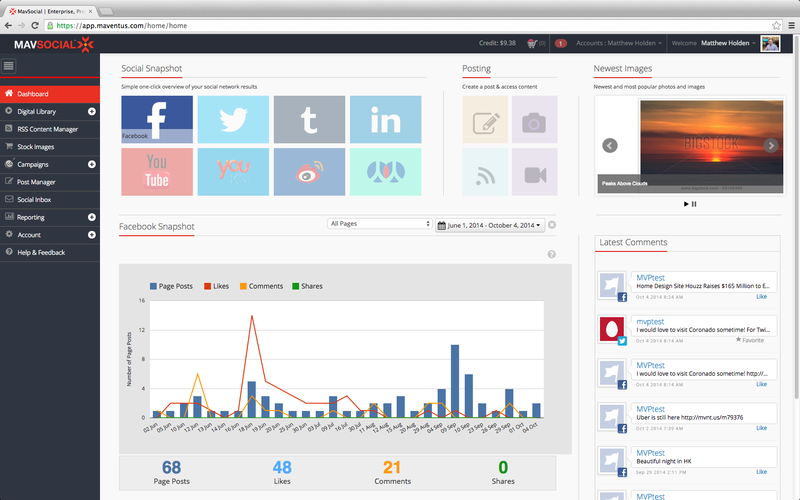 It is a visual content management and social publishing software. 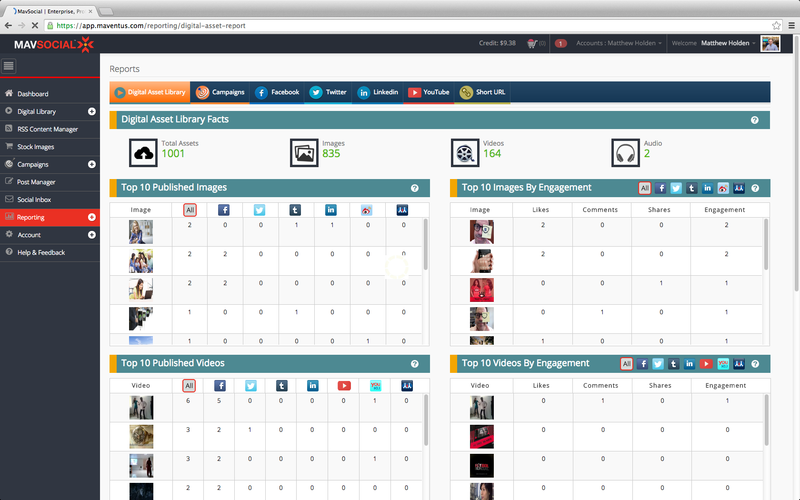 I already use HootSuite, Buffer and Tweetdeck so why am I so excited about MavSocial?? For me, it is the ability to store, share, and manage my images as well as purchase stock images right within the application. I have not found any other social media management software with this capability and I love it!! I am using the Pro+ Account (which is 99$/month) but there is a free starter account that you can try out as well. The free account offers you a lot of flexibility, which some other social media management software does not. There is nothing to install on your computer – it is all web-based and MavSocial uses Amazon Cloud storage for all your image and video files. Creating an account is easy. Just create a login, and then you are ready to add social networks and start using the application. The free account lets you connect to Facebook and Twitter, while the Pro+ account also lets you connect to LinkedIn, YouTube, Tumblr, and popular Chinese networks like YouKu and Weibo. When you login, you will be taken to the Dashboard which you can use to create, schedule and publish posts within just a few seconds. I find it to be very user friendly. After I created my account I immediately went to the RSS Content Manager and added the RSS feeds to my favorite blogs and sites. I use this feature daily to read posts and share them across my networks quickly and efficiently. 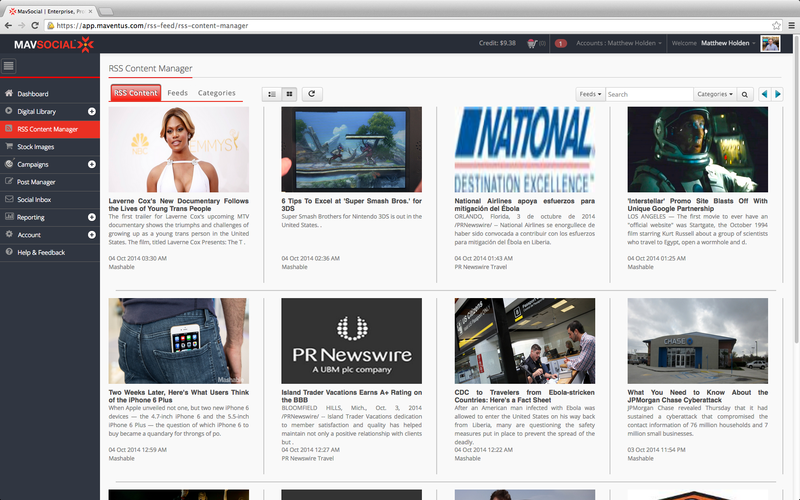 MavSocial has the capability for you to upload all those miscellaneous images that you have saved all over the place. The free account provides 1 GB of visual content storage while the Pro+ plan offers 100GB. For a lot of people 1 GB is adequate for storing photos. You can gather all the images you use for your blogs and social media posts and save them in one location. Plus you can access them through the application anywhere you go. No need to worry if you have an image saved at home but are creating a blog post on the road. You can upload various image types (jpg, png, gif), audio files (mp3, mov, wav) and videos (mov, mp4, m4v). The maximum file size is 1GB. You may add metadata such as title, description and tags, to make your visual content easier to find later on. After you upload content, you can then create a new gallery or add it to an existing one. What if you don’t have the right image to use for your blog post or social media post? You can purchase stock photos right within the application. No need to worry about violating copyright laws for those of you that still may be googling images and using them without the proper permissions. 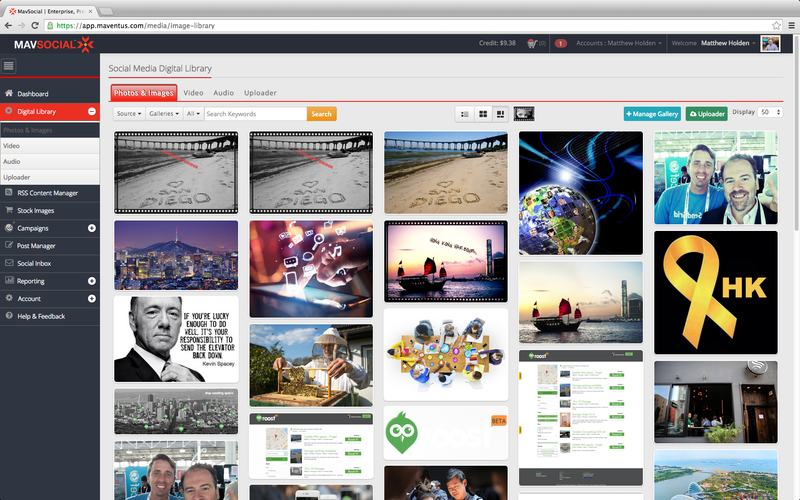 Through MavSocial you have access to over 35 million stock photos through Bigstock and Getty Images. They are all high quality photos and they are very reasonably priced. From what I have seen, prices range from $1.49 US to $2.49 US per image. Once you upload or purchase a stock image you have access to a simple photo editor. So purchase, edit and post all within the same application. This is a great feature as Visual Social Media continues to be a huge trend. Look at how Twitter redesigned its application to be more visual this past year. 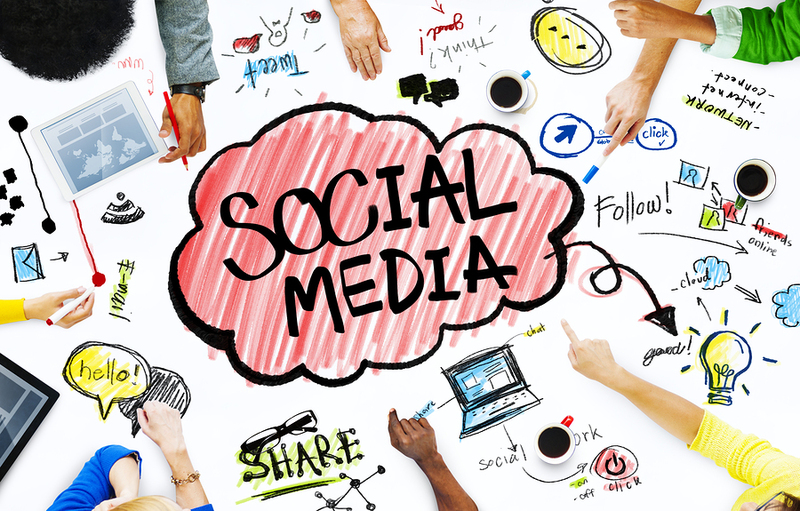 With MavSocial, you can also create social media campaigns. 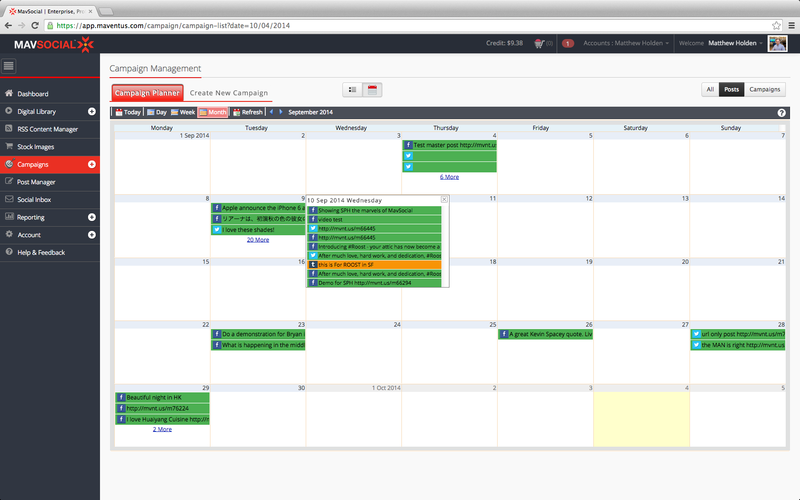 You can use a list or calendar view to create and edit campaigns within the ‘Campaign Planner’. Once you create a campaign, you can go into it and add new posts or edit posts that you pre-scheduled. What’s great is that you have access to analytical reports on the campaigns you create. I am using this feature for my old blog posts. Now they are no longer dormant on my blog but brought back to life again. The Pro+ plan offers detailed analytics and reporting by network, campaign and visual content. Reports are available for the Digital Asset Library, Campaigns, Facebook, Twitter, LinkedIn, YouTube, and Short URL. This is great if you are using MavSocial and need to report back to various clients so that they can see the impact that their social media efforts are having. So far I am very impressed with MavSocial. I am looking forward to future capabilities like being able to publish to Pinterest and Google Plus. I would love to hear your thoughts about MavSocial. Sign Up for a Free Starter Account here and let me know what you think in the comments below. I am a brand ambassador for MavSocial and do receive compensation for my hard work and research. Good or bad, my reviews are honest with my readers best interest in mind. What are the services your business offers? Curious as my business is growing/changing.